This promotion is ONLY available from 7 November 2018 until 23 November 2018. This promotion is ONLY applicable / redeem on Friday – Sunday. This promotion is NOT VALID on Monday to Thursday. 2. Ticket redemption is from 24 November 2018 until 1 January 2019. This promotion is ONLY valid for ONLINE Purchase. 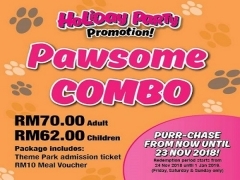 Complimentary RM10.00 meal voucher will only be valid on the redemption date. Tickets must be purchased at least 24 hours before your visit to allow your transaction to be processed. Failure to do so may mean normal admission charges to enter. This promotion is non-refundable, not exchangeable for cash & not applicable with other ongoing offers, events and/or promotions. Ticket valid for ONE admission per day. Child denotes that above 90cm in height and aged 12 years and below. Free entrance for children under 90cm in height. Lost World Of Tambun Management reserves the right to refuse, alter, amend, delete or add to the stated terms and conditions or withdraw this promotion at any time without prior notice. For your comfort and safety, all visitors are required to comply with DRESS CODE when swimming or using the rides in the water park. Check out Sunway Lost World Water Park for more information!